“Has the LORD as great delight in burnt offerings and sacrifices, as in obeying the voice of the LORD? Behold, to obey is better than sacrifice” (1 Samuel 15:22). That’s a truth to keep central as we enter this season of Lent. It’s possible to make a grandiose resolution and miss the reality at the heart of the season: We are to take on the image of Him Who “humbled himself and became obedient unto death, even death on a cross” (Philippians 2:8). About [two years]ago one of my closest friends started reading Mother Teresa, Come Be My Light. My friend, who is Lutheran, soon asked me if I could explain something to her: it seemed very strange that Mother Teresa, who God was clearly speaking to and giving a mission, would have to go and receive permission to undertake the work from her religious superiors. At first her superiors made her delay. Why would Teresa submit to that, when she knew God was speaking to her? There are people of wisdom within religious orders but it is by means of simple men that God brought them there. God chose the foolish and weak, the lowly and ignorant to bring together those who were wise, powerful and of noble birth through them, “so that no human being might boast in itself” (cf. 1 Cor. 1,26-29) but in him who came down, who came to Nazareth, and who was subject. Our obedience is a participation in the very obedience of Jesus! 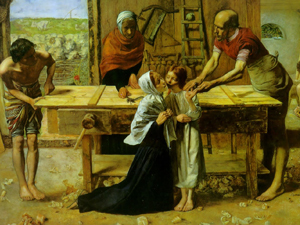 The Father’s Revelation in Person, made His plans subject to “a workman and a poor young maid.” So whenever one of us submits ourselves to the decisions of our bishop or the disciplines (traditions) of the Church as opposed to our own personal “inspirations,” it is Jesus’ obedience that we are tapping into; and that is life’s very goal! We’ve heard time and again that the Church is the Family of God. In truth, it is the Family of Nazareth thrown open to the entire world. And those God places in leadership may not be the smartest, or the most “charismatic,” or the most plugged-in as to what He wants to accomplish in the moment; but they are to be obeyed, because doing so places us firmly in the One Who obeyed “a workman and a poor young maid.” May the Lord grant us a holy and profitable Lent! Wonderful article, Shane! I just signed up for the Daily Gospel emails.